Call it the house that Skype built. 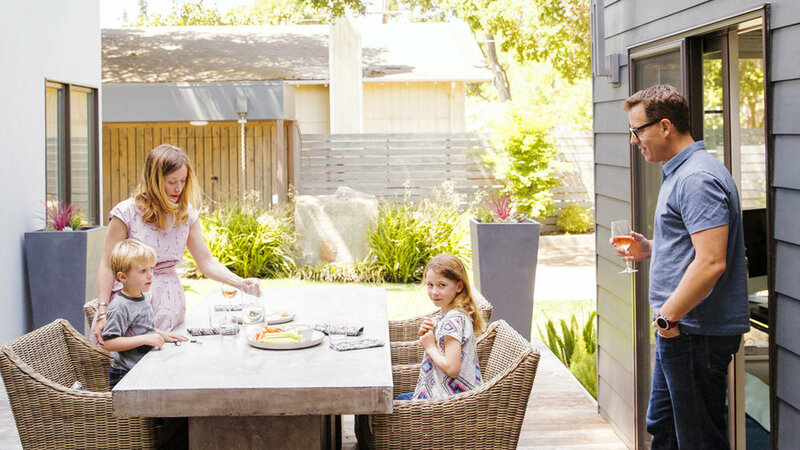 In 2011, while living as expats in Tokyo and then Singapore, Stephanie Kerst and her husband, Stuart, took on the renovation of a Menlo Park, California, bungalow as they prepared to return to the States. “It was a pretty unusual way to build a home,” Stephanie says. 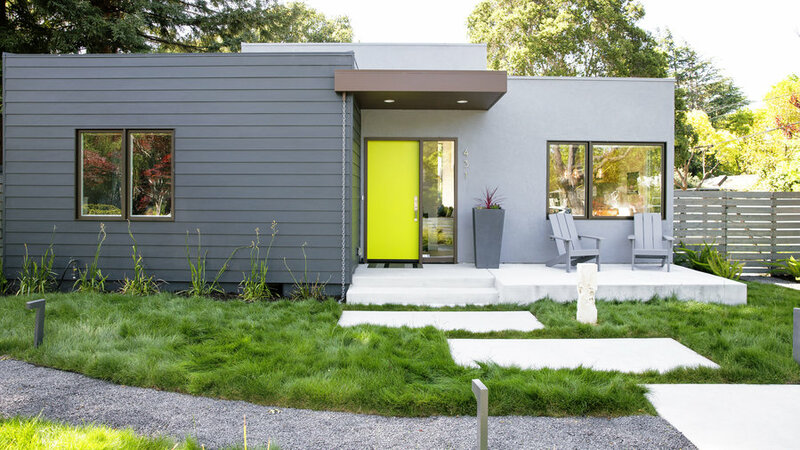 But through a series of video calls with architect Ana Williamson and contractor Brian Emery, they devised a plan to expand on the existing 900-square-foot home in a way that made sense for them—and was good for the planet. Williamson used cement fiberboard and integral color stucco on the exterior. 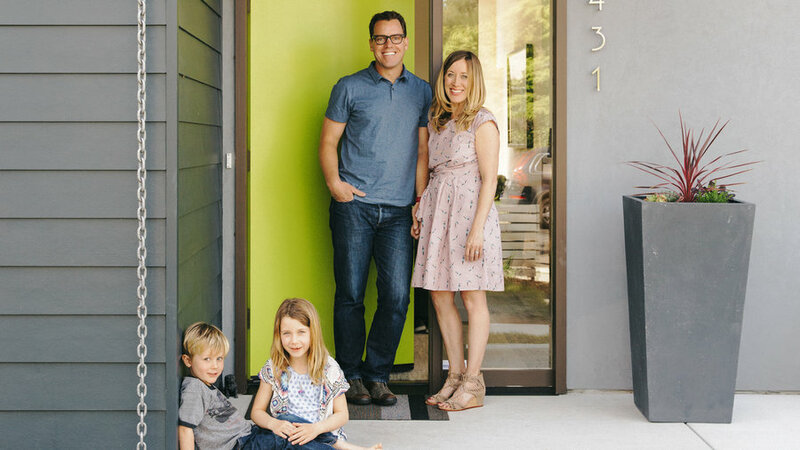 “It doesn’t have to be repainted every three to five years, so it’s better for the environment,” says Stuart, with Stephanie and their children Ford (4) and Avery (7). “A lot of our inspiration came from our time in Japan,” Stuart says, explaining the home’s contemporary look. A few heirloom pieces came back with them like the cabinet from Singapore in their entryway. It’s a convenient spot to stash shoes. Shunning carpet helped avoid fumes and off-gassing that can take place after installation. Instead, the couple sourced engineered European white oak for the floors and rift white oak for the kitchen cabinetry. 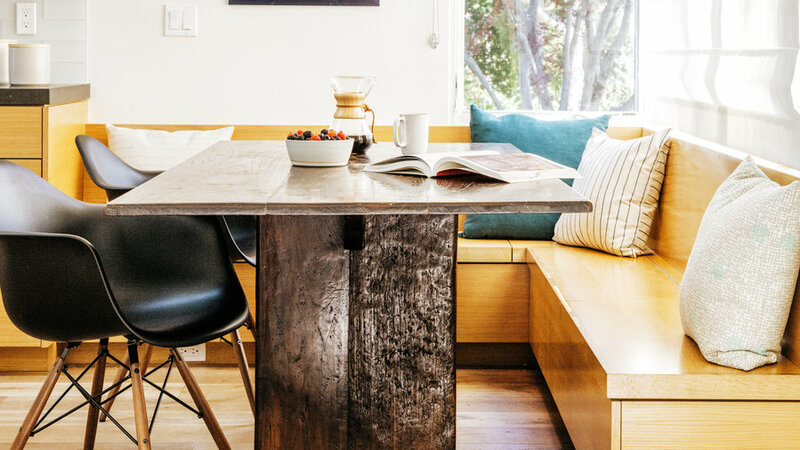 The kitchen banquette fit the couple’s desire to keep the design as pared down as possible. With “modern organic” as their filter, they added in textural furnishings like the rough-hewn table and blown-glass and iron chandelier. In the living room, Williamson raised the roofline to 12 feet. 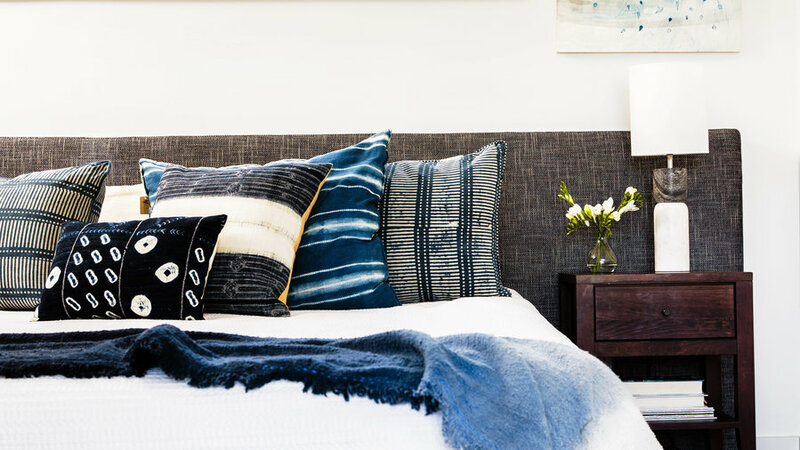 “That created a sense of loftiness, which makes the space feel larger than it is,” she says. 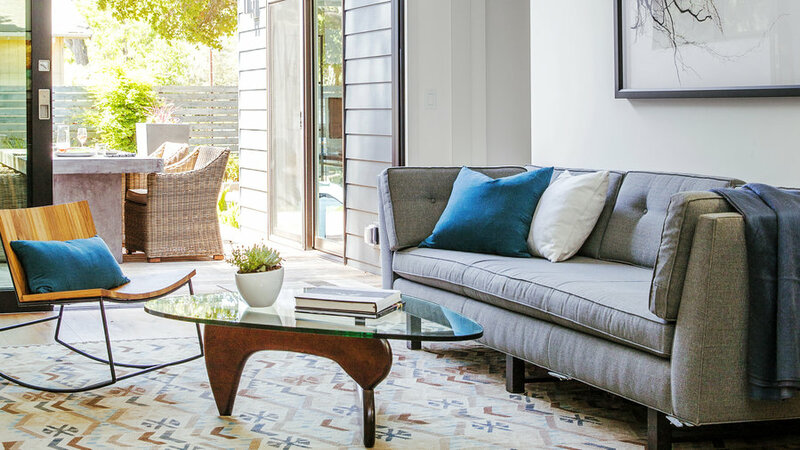 Industrial 10-foot sliding doors allow a view of the 100-feet-tall redwoods in the backyard. 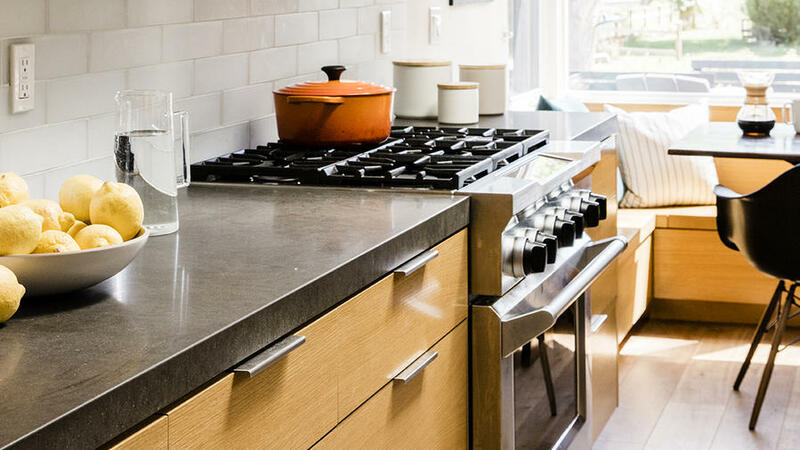 But even with all these ways to add tech to your home, where do experts recommend omitting devices? 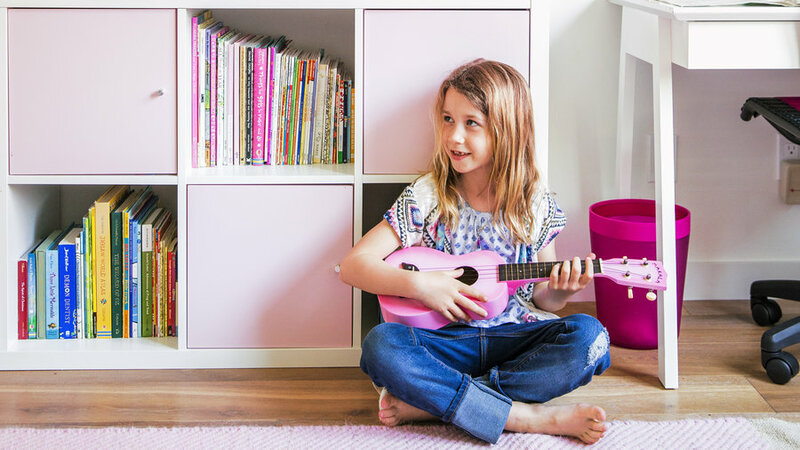 When it came to the kids’ rooms and bathroom, the Kersts thought less about color schemes and furnishings and more about reducing exposure to electromagnetic fields (EMFs) from wireless technology, fluorescent lighting, and electric devices. To that end, they placed the electrical meter—an analog model, which emits less radiation than a smart meter—far from the bedrooms and installed incandescent lights in place of CFL bulbs, which emit higher levels of dirty electricity. “For us, lowering our exposure to EMFs is on that list of keeping a healthy home,” says Stephanie. Jim Redman of Elements Landscape devised a yard with plants that don’t need a great deal of hydration, including Delta Bluegrass.